Marzipan! This delightful combination of sugar and almonds is, next to ice cream, probably one of the tastiest sweet things I know. Would it not be practical, then, to combine the two for maximum indulgence? 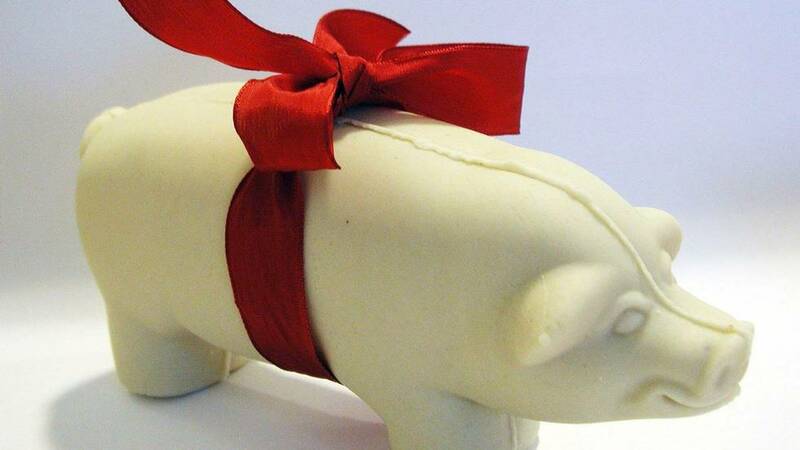 Marzipan pigs are a common sight in many Scandinavian countries around Christmas. I still get one from my loving mother every Christmas: a clear sign that my youthful kitchen raids against her stock of almond paste were quickly forgiven. As far as I remember, ever since I raided my mother’s kitchen in search of almond paste as a little child, I have had cravings for marzipan and its close sibling, almond paste. I don’t know exactly what it is that makes this product so spell-bindingly attractive to me, but I would guess the secret lies in the fortuitous combination of sweet almond flavour and the soft-solid consistency. 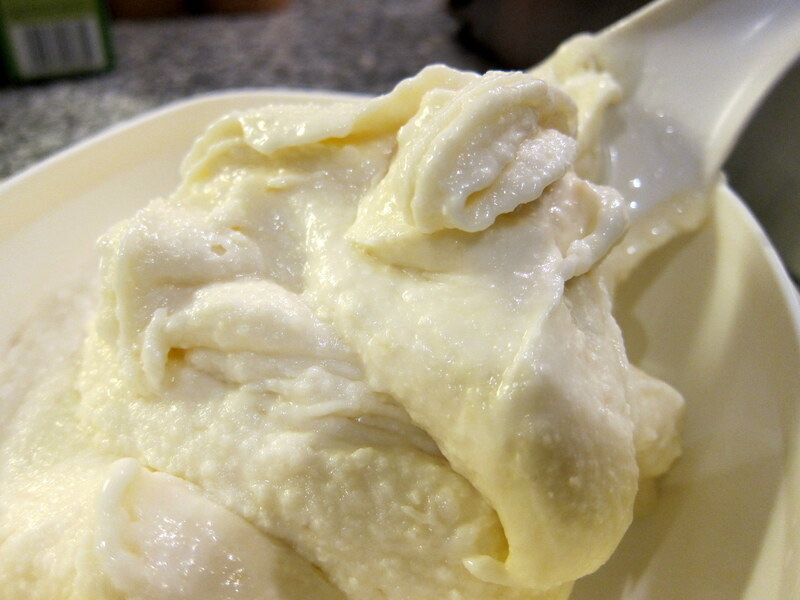 But making marzipan ice cream is not necessarily easy. Having tested a few methods, I can conclude that dissolving marzipan in an ice cream base often nets you a nice almond-type ice cream. But not really a marzipan ice cream, if you get my drift. What I was after was something that did not only taste (more) like marzipan/almond paste, but also conveyed at least something of the texture. Today, I think I have a working recipe! If you – like myself – also crave marzipan and almond paste from time to time, this should turn out to be a very memorable ice cream 🙂 . If I would have to specify the ice cream base used, the closest type would probably be “gelato” (= high proportions of milk and sugar, little or no cream). I should perhaps also warn you that the recipe contain quite a lot of sugar (as does marzipan …). If you would like to try using less sugar, I think that might turn out nicely too. But here, I went for something akin to “ice-creamized marzipan” so, although very sweet, it does come across as a rather faithful adaptation. And while high on sugar, the recipe at least contains no eggs. While eggs could be used, I instead decided to try some natural Agar agar as stabiliser. Unlike eggs, Agar agar contains almost no calories. And wow – it does pack a lot of stabilising punch! In fact, you could probably get away with using only about half of the Agar agar noted in the recipe and still have sufficient stabilisation! 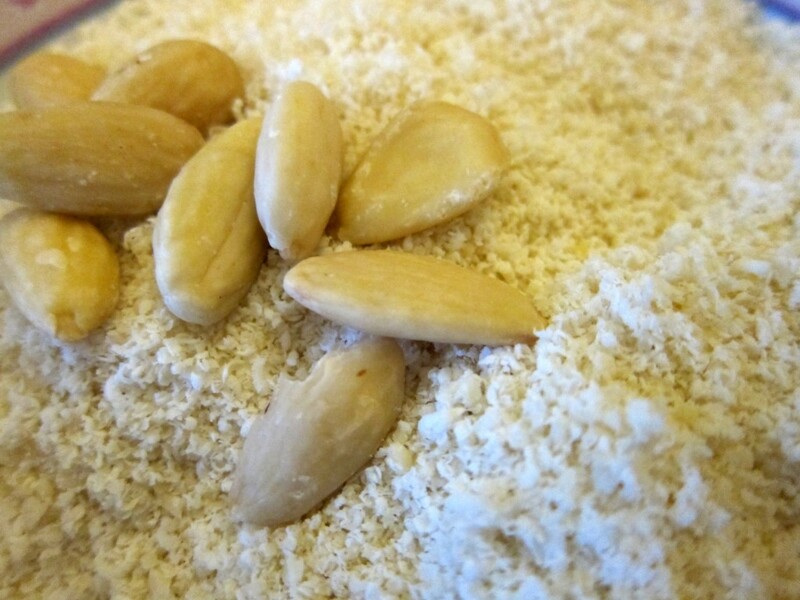 In order to get closer to the texture I was after, I decided to ground almonds (blanched) myself, rather than dissolving ready-made marzipan/almond paste. Preparing the ice cream base is very simple: Put together the milk, the ground almond, and the sugar. Heat until warm/hot, then add the Agar agar! Agar agar – one of the ‘natural’ stabilisers. A (very) small amount goes a long way though, so be careful about the measuring. Agar agar has been around for quite a while. This product, derived from seaweed or red algea, probably still counts as one of those ‘exotic’ (hard-to-find) stabilisers one reads about in books. But to my surprise, even some of my local supermarkets have actually begun to sell it now, so perhaps it is getting more commonplace. Anyway, Agar agar is very interesting – and effective! For a standard batch of up to about 1 liter/1 quart, I would strongly suggest that you start out by only using about 1 gram (= 2 levelled teaspoons). That seemed very little to me, and I had my doubts. But when I saw the stabilisation set it, I quickly changed my mind! Measure carefully – a little goes a long way: after all, you want to end up with an ice cream base, not a rubber dough! Dissolve the Agar agar in hot liquid (as it is insoluble in cold water), then bring it to a boil [in order to “trigger” the agar] and let simmer for a few more minutes (say, about 4 minutes or so) before taking it off the heat: that should properly activate the stabilising effect! The solidifying effect begins to show once the cooling liquid reaches about 40°C ( 37° Celsius/98.6° F, to be exact). 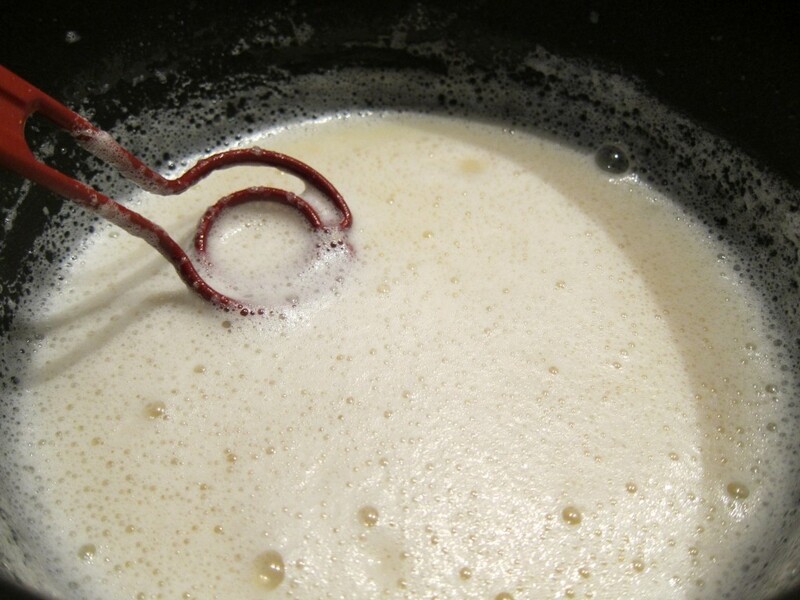 For ice cream-purposes, the easiest way to ensure that Agar agar is properly used is probably to simply heat the base, whisk in the Agar agar and bring it all to a boil. Then, let the base (with the Agar agar) simmer close to the boiling point for a few more minutes. Unlike for instance gelatine and corn starch, Agar agar does not lose its stabilising powers if exposed to prolonged heating – in fact, as just noted, it needs to reach a boiling temperature to work properly. Should you deal with delicate ice cream ingredients not suitable for boiling temperatures, try to add them to the base once it has begun to cool down. Agar agar does not begin to stabilise immediately, so there is some time to do it at more forgiving, lower temperatures. Most of the base has been added (all, if you do not want to add any cream), and has been brought to the boil. Agar agar has been added and the mixture will simmer for about 4 more minutes before being taken off the heat. Once the ice cream base (with the Agar agar) has been brought to the boil and then been through the minutes of simmering, take it off the heat and let it cool down. After a while, you will be able to notice the gelling effects of the Agar agar … don’t worry: it if looks too compact and “lumpy”, just whisk and you will notice that the overall consistency is very soft and not at all rubbery (if you have not overdosed on the Agar agar, that is 😉 ). Once cooled down, churn the ice cream base in your ice cream machine (or still-freeze using only your freezer, according to the good advice given in this helpful post). 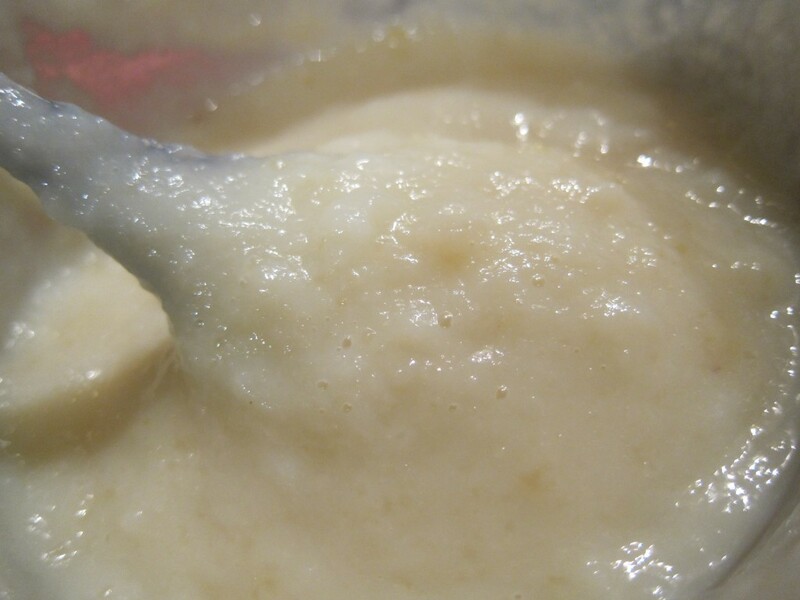 If you want to add some further richness and also somewhat “soften” the overall flavour, I can recommend adding about 100 ml (0.4 cup) cream straight into the ice cream base during the last minutes of the churning (hereafter you should allow for a few extra minutes of churning …). Enjoy immediately, or allow the ice cream some further time in the freezer to firm up (it will take some extra time, given the high amount of sugar!). Marzipan ice cream – finally a worthy version! Just because I love marzipan and almond paste, I almost never order marzipan ice cream in ice cream shops – I can’t bear the disappointment. Luckily, this recipe made me feel elated! It manages to convey all those nice things which I associate with the heavenly almond confection: the clear, full and sweet almond flavour and that elusive, tasty mouthfeel hinting at the existence of small almond particles. 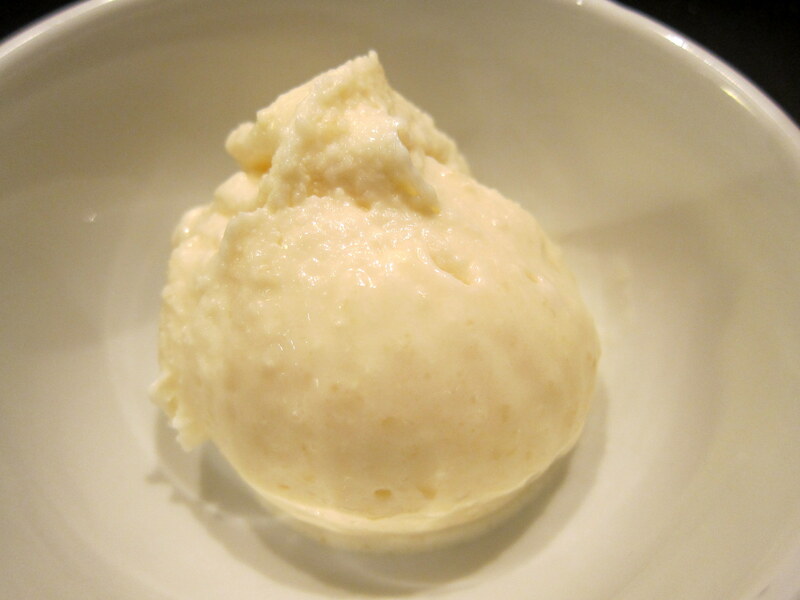 In conclusion: this is not simply “another almond ice cream” – it is marzipan, reborn as ice cream! 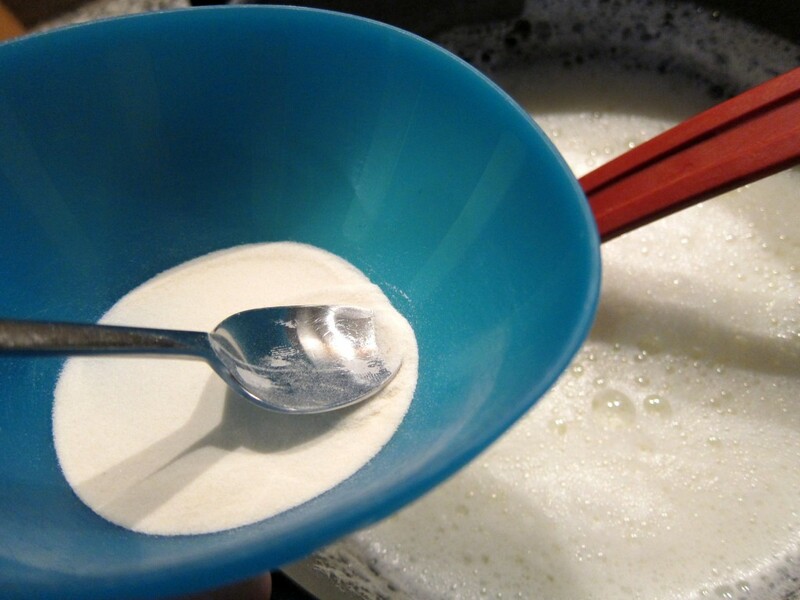 Add milk, sugar and the ground sweet almonds in a saucepan and heat until warm/hot. Then add the Agar agar and whisk. Bring to a boil, then turn down the heat to a simmer for about 4 minutes. Take off from the heat and let cool down, possibly even chill. Once cooled/chilled down, whisk, then churn the ice cream base in your ice cream machine (or still-freeze, using your freezer). Towards the end of the (machine-)churning, add the cream and let the churning finish. Once ready, enjoy the ice cream fresh on the spot or store in freezer-safe container (with plastic film and lid over) in the freezer. Note that the Agar agar should be added to warm liquid and be brought to a boil in order to properly "activate" its gelling qualities. 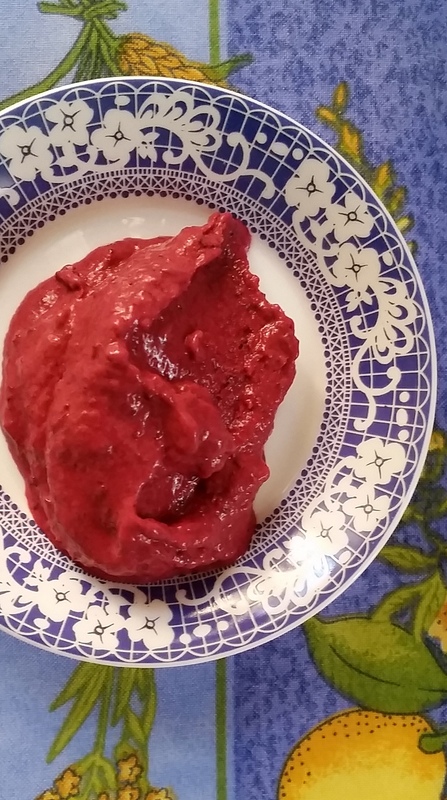 Also note that you could probably get a very nice stabilising result even with less Agar agar than what is set out in the recipe - if you do not like ice cream bases that settles too firmly, I would suggest trying with only about ½ of the Agar (= slightly more than 1 teaspoon). 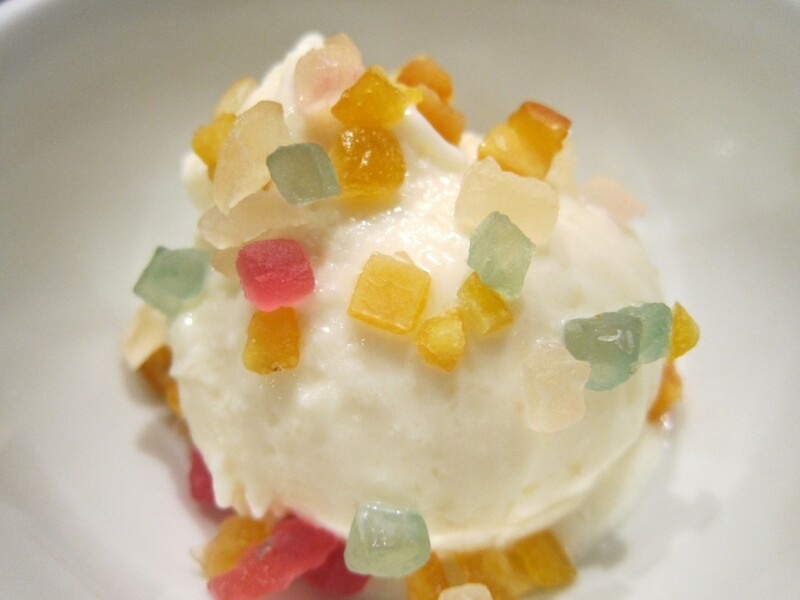 If you like to add things to your marzipan, why not do the same with the ice cream? How can I make your recipe diabetic friendly? Are Agar Agar flakes ok or does it have to be powder? If I’m using the still-freeze method, when would i add the cream? Or should i skip that step? When still-freezing, I would say that, for the best results, you should probably add the cream together with the milk from the very beginning. You could also add the cream towards the very end, before you put the ice cream base into the freezer to freeze, but that method really works better with an ice cream machine. Best of luck! Is there anything else I can use instead of Agar agar? It’s proving hard to get hold of. As Agar agar is a stabiliser, you could try with any other stabiliser (you can find a few listed in the post-link!). You could, for instance, try your luck with starch! 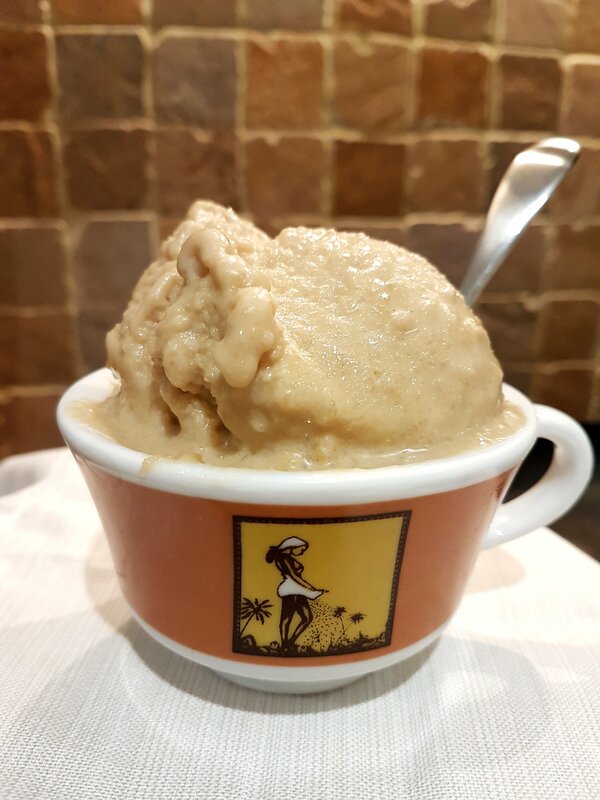 If you search the site, you will find plenty of recipes using the ‘sicilian gelato’ base: I hope it will serve you well, in the absence of agar agar. Hello I enjoyed the web page. I would like to know where you can buy the pig mold. 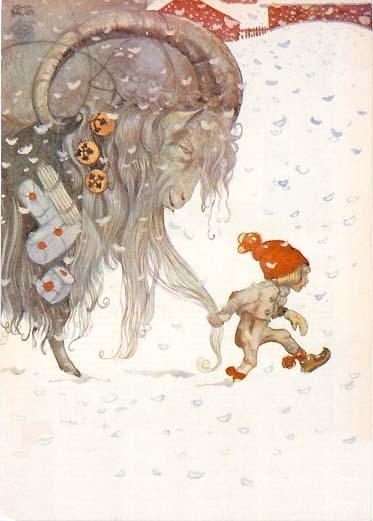 As it is similar to the Christmas pigs I grew up with. I wish I knew, but the nice marzipan pig was bought in a store and I have not come across any such moulds for sale.